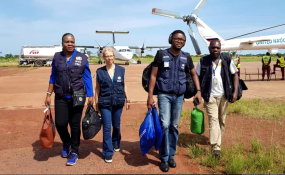 Uganda's disease surveillance system was recently put to a rigorous test when two people, contacts of confirmed Ebola Virus Disease cases in DRC crossed into the country through Kasindi Point of Entry (PoE) on 20th January 2019. The two, a female and male are from Katwa in the Democratic Republic of Congo (DRC) where they were under daily follow-up by health workers. However, they managed to escape the surveillance teams in DRC and made their way to Uganda through Kasindi where again, they eluded Uganda's surveillance teams at the PoE as they had no symptoms. Luckily, their disappearance and movement to Uganda were promptly detected and reported by colleagues in DRC - thanks to the excellent cross-border collaboration. Uganda's surveillance system immediately swung into action using health workers, security personnel, immigration officers and Village Health Teams (VHTs) among others to look for the duo. T he hunt has not been easy or quick and it brought tremendous anxiety to many people. But on 30th January 2019, the two were located in one of the suburbs of Kampala. They were in good health with no signs and symptom for EVD and they have completed the 21-days mandatory follow-up for all EVD contacts. While Uganda's disease surveillance system is commended for actively looking and follow up the two cases, the incident also points to some gaps that exist especially on the porous border. People do not necessarily use the gazetted crossing points which makes the work of disease surveillance officers a daunting task. A sensitive surveillance system at health facility and community levels is the safety net for the country given that people incubating Ebola disease can easily cross into the country. In addition, the incident is a wakeup call to all people that EVD is just a few hours away from Kampala or any other city, given the efficient transport system that connects the world. As WHO constantly reminds everybody, alertness by all, a high index of suspicion especially for sickness with bleeding tendencies and prompt reporting are key to early detection and containment of the disease. Uganda has activated an elaborate community engagement and Community-based Disease Surveillance system, especially in the five EVD very high-risk districts to help with disease surveillance and prompt reporting. Under this arrangement, WHO has supported the Ministry of Health to train and deploy 7,387 VHTs, 265 traditional leaders, 330 religious leaders, 1,463 sub-county leaders and 2,693 LC1 chairpersons in the five districts. While there is no confirmed case of EVD in Uganda, preparedness activities are in high gear such as active surveillance, risk communication, collection and testing of samples and construction and equipping of Ebola Treatment Units in high-risk districts including Kampala and Wakiso districts to treat possible cases. H ealth workers hope that the above system, with the active participation of all people, will promptly detect incidents of people sneaking into the country from EVD outbreak areas and appropriately handled. If they sneak in and fall sick, the system is ready to isolate and treat them or handle any other eventuality.